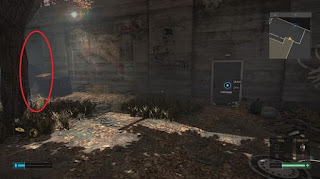 To start Neon Nights (SM00) side mission in Deus Ex Mankind Divided, you have to go the backyard of your apartment and listen to the two men as they talk about the drug called Neon. They speak of bonbon, the dealer for Neon. You will also find her a few steps further in the backyard, but she won’t sell you anything from the "stuff", as it should be dangerous for Optimists. Look around, you will find an electrical box. Now you can use it to climb the wall and get to the ledge along the camp. In a safe you will find a Pocket Secretary (PDA). Read the message and SM 00: Neon Nights starts. The message also contains a code (0310) for access to the apartment. - Now you have to find and break the weak wall near the safe, there you will find another Pocket Secretary that stated that Neon is deadly for Optimists, since it is incompatible with the Neuropozyne. - Now leave the storage room, we just went out through the door. The bodyguard noticed, but if you continue running straight and do not stop, he will not search for you. - Go back to the house. Directly behind the door to the apartment is a security guard, you open the door with the code 0310, you can quietly go behind the guard. Go into the apartment, you can also use the air shaft at the stairs on the right. - Along with the guitar on the small table you will find a PDA that gives you the password to the laptop. In addition, you learn that another group dealt with neon. Did you read all the emails from bonbon, you get a new waypoint for SM 00: Neon Nights. There in an apartment you need to look for clues that will help you to bypass the dealer of Dvali. So Make your way to the subway and go to the marked stop (blue top links on the map). The waypoint will lead you to the apartment house. However, you can not enter the apartment easily. We have to hack the door. If you need help, read our guide to hacking or simply uses a multi-tool to get in. Once you enter the apartment, a smart home system activates that recognizes that you have not authorized, you stay in the apartment. It alerts the security, before that you can hide in upstairs. In the bathroom you find a PDA, from which you learn that you get to the Rave only with an appropriate access card (Key Card) and the nice note to the author that the apartment has to be cleaned up. Once you have read the news, you will receive the next waypoint for the side quest SM 00: Neon Nights. Thus you will receive the access card to Rave, you must now hack into the laptop in the living room, which is very simple. The Home AI you can open the wall panels (option SECURITY), whereby it reaches some extra credits and what is more important:. About the ENVIRONMENT option you can hire the cleaning service and read the confirmation email of the company. From this you learn that the cleaning crew will indeed make this apartment clean, but they ask you to take a walk and come back later - when you return you will find two access cards on the bed. - Visit the underground and return. Step into the apartment again, go up and look on the bed. The following figure shows what you’ll find on the bed. - Go to the front door of the raves and use the access card to open the door. Now you can open it without any problem. - Go past the entrance immediately to the left and hack the door. Since it is only protected by a firewall security level 1, you should have no problem with it. - In the room itself you'll find the body of Optimists and if you searched him, you will find a PDA. Read the contents of the message. 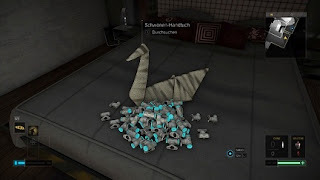 In this part of the side mission SM 00: Neon Nights you have to search the office of the cleaning services to find out who is at Optimists behind the distribution of Neon. The door of the office is marked with the image of a swan. Follow the waypoint to the destination. Here you will see many additions to hack. - To give us access to the offices, we hacked the door. With special augmentations, it is possible to get in via the ventilation shafts. - The door, however, is only protected by a security system of the level 2, it should not be a problem for anyone. - Within the office, next to the sink in the kitchen, you will find a spray bottle. With this you can open a secret passage in front of you. - In the secret room you will find a safe. Link at the side of the safe is the code. We were unable to find the password for this and we have cracked the safe. Just use a multi-tool, if the security level appears too you then its complicated. - Grab the contents of the safe and read the PDAs. You can learn where the laboratory is located and get the access code for the first two doors. The chemist Harmony operates in the illegal neon laboratory for Dvalis but smuggles something from the drug addition, and sell it together with the cleaning service. If you enter the sewer system, then the side mission SM02 will start. However, this time, you have to turn right. Before you start this section, you should be sure that you have two bio cells in the luggage. You will need them. - The first door on which you must enter the code 0311, located on the bottom right. - Wait until the gun is pointing in the other direction and sneak under this round. On the other side you jump out again when it is again rotated in the other direction. Run quickly upstairs. - Above, you can open the second door with the Code 0311. The following path is more complex, because you must go to the Security Laptop. - Once you have you turned off the security system, go back out of the room then turn immediately left. Up along you will get directly to the office of Harmony, you must now speak. Select the answers example, they will assist you. - Answer 1: Decide here for WARN and make Harmony realized the risks. - Answer 2: If you choose give up, noted the chemist, that you be united and will let you do. - Collect the table behind her, the PDA and the multi-tool which you will immediately need. - The door leading to the tank is equipped with a high security level and therefore, here you can use the multi-tool. - Supply the each tanks with a Bio cell and create a memory status, because now you have to pick the next terminal, but this is very simple. - Click now on EMPTY TANK and already you have completed the side mission SM 00 Neon Nights. The addition Crawl should be no problem now. Hold on to the left and take the ladder to climb up.